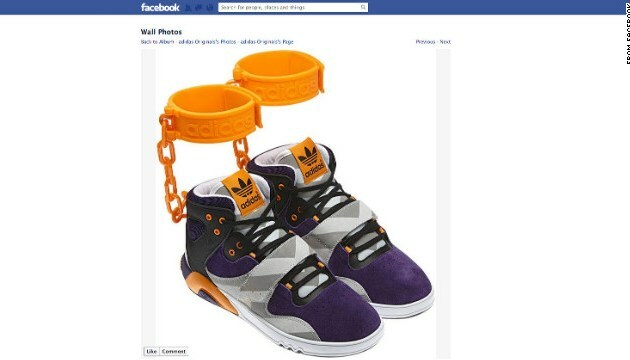 (CNN) -- German sports apparel maker Adidas withdrew its plans to sell a controversial sneaker featuring affixed rubber shackles after the company generated significant criticism when advertising the shoe on it's Facebook page. The high-top sneakers, dubbed the JS Roundhouse Mids, were expected to release in August, according to the Adidas Originals Facebook page. "Got a sneaker game so hot you lock your kicks to your ankles?" a caption below a photo of the sneakers read. The June 14 post prompted plenty of criticism from around the web, with many of those commenting saying they felt the shackle invoked the painful image of slavery. "Wow obviously there was no one of color in the room when the marketing/product team ok'd this," said a commenter identifying herself as MsRodwell on nicekicks.com. "I literally froze up when I saw a new design from Adidas set to hit stores in August," said Dr. Boyce Watkins in a post for the website Your Black World. Though dismissing the criticism in a written statement by defending the sneaker's designer, Jeremy Scott, as having a "quirky" and "lighthearted" style, Adidas nonetheless said Monday that it planned to cancel the shoe's release. "The design of the JS Roundhouse Mid is nothing more than the designer Jeremy Scott's outrageous and unique take on fashion and has nothing to do with slavery," the statement said. "We apologize if people are offended by the design and we are withdrawing our plans to make them available in the marketplace." One of Adidas' most high-profile condemnations came from the Rev. Jesse Jackson. "The attempt to commercialize and make popular more than 200 years of human degradation, where blacks were considered three-fifths human by our Constitution is offensive, appalling and insensitive," Jackson said in a statement Monday, prior to Adidas's decision to withdraw them from the marketplace. The photo could still be found in the photo section of Adidas' Facebook page Tuesday morning. And whether Adidas wanted it or not, the sneakers were still inspiring a spirited debate about race in the comment section of its Facebook page. Am I the only one who looks at these sneakers and immediately think of the 1984 hit 'Shackles On My Feet'?